This shot is a bit distant, but it’s the only way to get much of this lake in the frame! 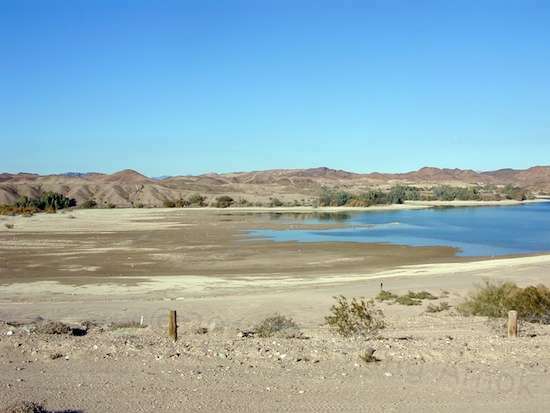 Squaw Lake is adjacent to Senator Wash Reservoir at the Imperial Dam LTVA (Long Term Visitors Area). The facility and access to it are 100% paved. 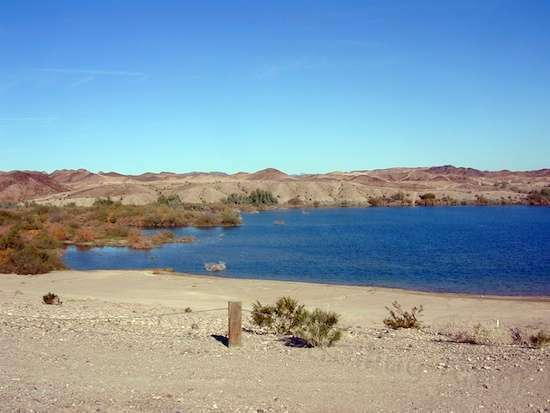 Squaw Lake is a Recreation Fee Area, which means that there is a day use fee of $10 and overnight camping at $15. 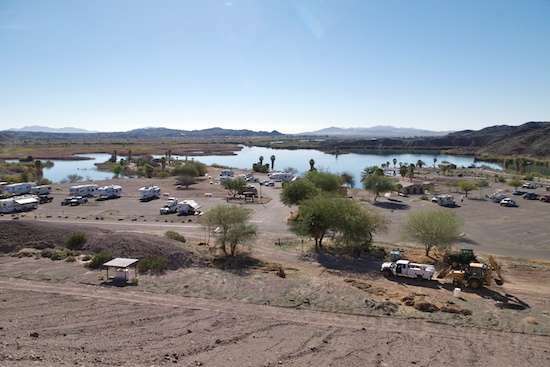 The camping duration limit is 14 days in any 28-day span, and then if you wish to return after your 14, you have to either pay for a two-week pass at the Imperial Dam LTVA, or go at least 25 miles away for two weeks before returning. Unaffordable for the common mortal? You bet. But there are pleasing alternatives. At center, the main parking lot offers access to fun if you have a boat, and superb surroundings if you don’t. Squaw Lake has a lot going for it. Besides the usual picnic tables and restrooms, it offers hot showers. 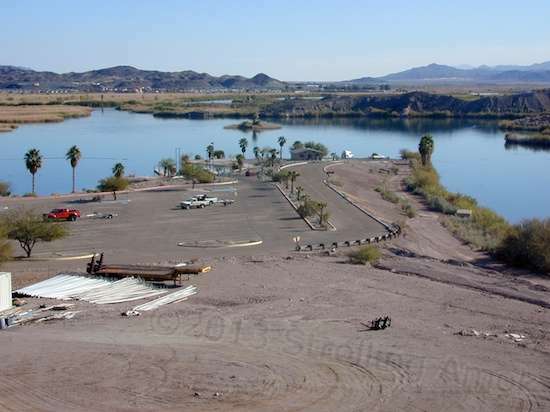 A swimming area is there, and a paved boat ramp offers access to the Colorado River. 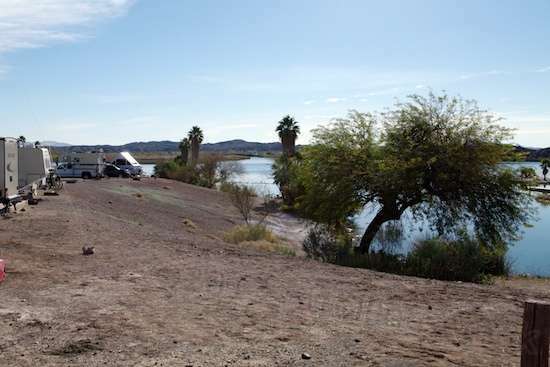 The views are magnificent for 340 of the 360 degrees around, and the only drawback – a significant one for me – is that while the boat trailer area is generously laid out, the two camper parking lots are tight. Small campers and motorhomes will have no problem, and even big 40’ motorhomes have a fighting chance most of the time. But, I could wedge the Defiant in only if the lot was mostly empty, since there’s precious little room to maneuver otherwise. These lots are such that my trailer alone barely fits without narrowing an aisle. One other camper or tow vehicle in the wrong place could make getting out after a two-week stay a serious ordeal. Only the far corner slots are problem-free. This is one of those places where the better maneuverability of a fifth-wheel could make the difference – but try to find one that small. 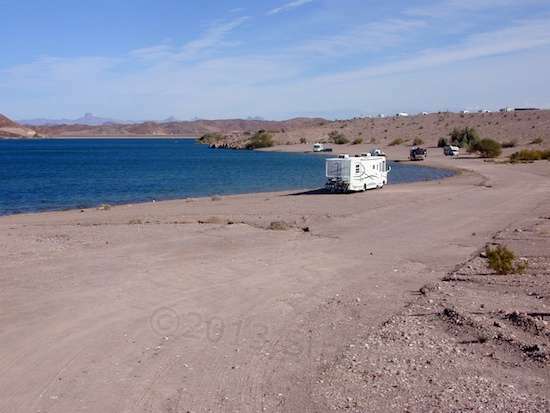 Camping in the boat trailer lot, with its spacious diagonal pull-through parking, is prohibited of course. A strip for tow vehicle parking in the center trades maneuvering room for orderliness. Notice the pickup and TT at center, backing in. How much do you think you’d have to cough up to stay at some hotel or resort with a lakeside view like this? The Senator Wash Reservoir shoreline, perhaps a mile away. 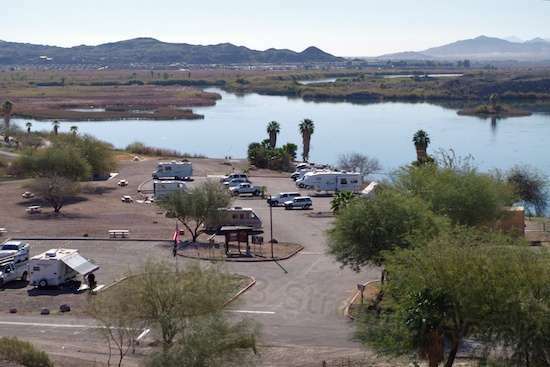 Camping is available along the shore, while a quarter-mile walk back toward Squaw Lake gets you a day use-only area with boat ramp, restrooms with outdoor showers, very nice picnic tables, a crude swimming area, and a nice paved boat ramp. Betty’s Kitchen Interpretive and Watchable Wildlife Area located at the end of County 7E next to Mittry Lake. I thought this was part of Mittry Lake Wildlife Area itself when I went cruising through it, but no. Apparently due to a wildfire a couple of years ago, the parking lots of Betty’s Kitchen area are cordoned off for the time being. It looks like it’s being revamped with irrigation piping, and much of it is dug up. No camping for now, looks like. 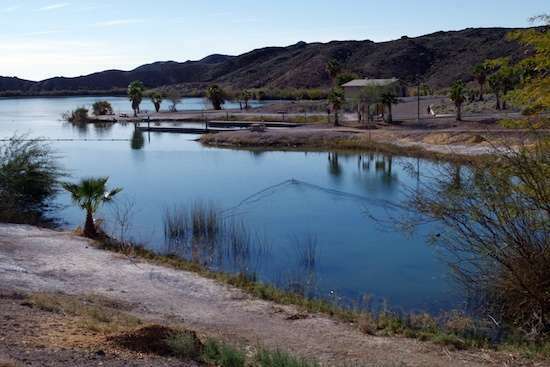 Oxbow Recreation Area and Boat Ramp, which is 4 miles south of Palo Verde, California. That’s next to the Cibola National Wildlife Refuge. I haven’t been there to check it out. The Ehrenberg Sandbowl is northwest of Quartzsite, 2 miles south of I-10 at exit 1. 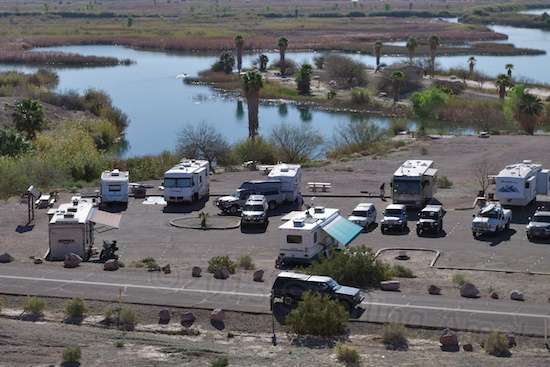 Adjacent to the Colorado River levee road, this is mainly an area for off-road vehicle use and isn’t of much use to most ordinary boondockers, especially since the surrounding area is loaded with free two-week dispersed camping. 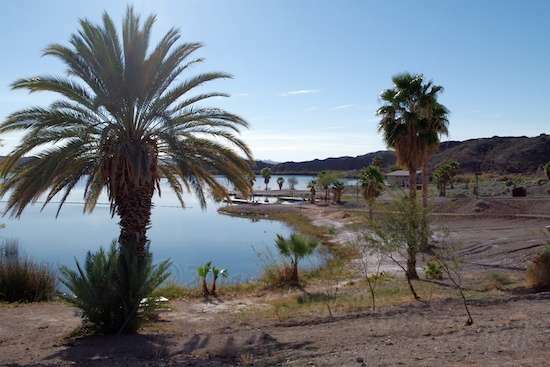 The recreation fee also provides for a 14 day stay at both the Imperial Dam LTVA near Yuma and LaPosa LTVA in Quartzsite, but only during the April 16-September 14 summer off-season. Shake & bake. This just isn’t the worst camping situation I can think of. Unlike most rigs, the Defiant is not designed to break camp and move in two-week stints, so I’m not sure I’ll ever take advantage of the Recreational Fee Pass. Admittedly, the nuisance of hefting and stowing the big solar panels is much less of a hassle than many folks face when packing away the explosion of crapola that they lay outside to make their campsite less distinguishable from home. There are also the increased costs compared to an LTVA pass, but it’s a fabulous value when you consider spending, say, the coldest months of the year mere feet from a lake in 70-degree temperatures! The view in the other direction isn’t too bad, either. 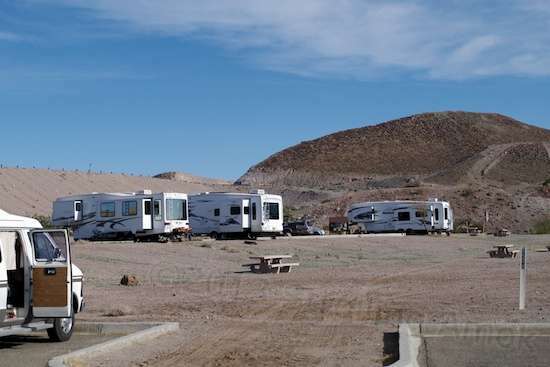 The Post Script of this saga is that the LTVA Pass in any form does include day use of a Recreational Fee Area, according to the camp host here. You can hang out, launch your boat or whatever as much as you like. You just can’t camp in a Rec Fee Area overnight. That’s why small boats and kayaks are seen so often here at the LTVA. They’re hitting either Squaw Lake and the Colorado River, or the Senator Wash Reservoir. Hard to see, but the boat ramp is just on the other side of the channel. The boat ramp snakes down to right of center. Between its width and the size of the parking area, it’s plain that it was designed for heavy usage. 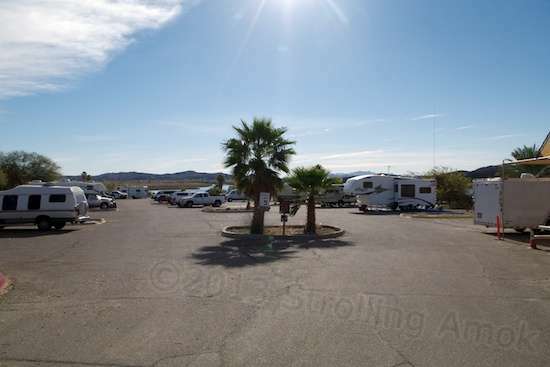 The entrance to the main parking area is pretty inviting for a truck camper, conversion van, small motorhome, or small travel trailer. And don’t forget that the annual pass includes shoreline access to the Senator Wash Reservoir, too. …And the next day can look like this. This is the only truly shallow part there is, but it magnifies any changes in water level! Congrats, Bill! Yep, I hit the rest areas and truck stops when I’m having to make time. I must say, the rattle of a big diesel ten feet away throughout the night isn’t my fav experience, but the convenience and price are right. Thank you, JR, but I suspect you’ll like the related post scheduled for Thursday even better! And I hope that your someday actually pans out, Linda. There are so many worthwhile locations to experience!